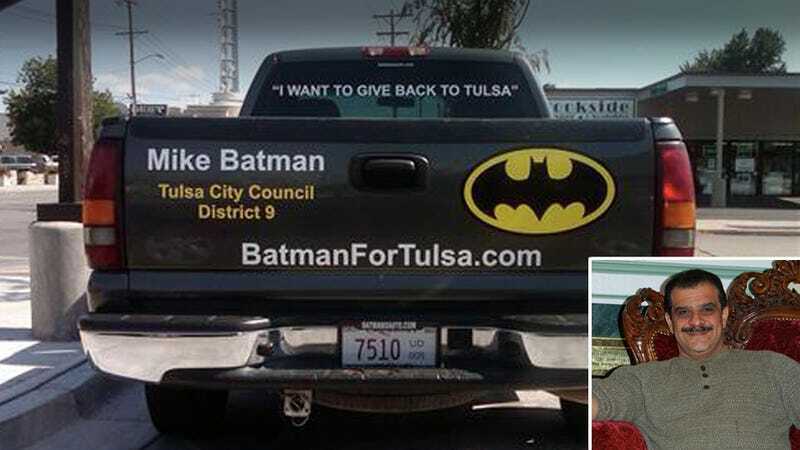 Exhausted after years of attempting to fight crime and corruption through extralegal means, Batman's running for City Council in Tulsa, Okla. It's an unlikely journey for Mike Batman, who went from Syrian immigrant to dishwasher to car salesman to, hopefully, elected official. Most mythologies place the Dark Knight as the son of wealthy elites in Gotham, but the reality is Batman started out as a school teacher in Damascus, Syria, before moving to Tulsa in 1983. His first job was working part-time at a Church's Fried Chicken for $3.35 a week, at least according to his extremely sincere website. Ever the upwardly mobile creature (the grappling hooks help), Batman worked his way up to a steak house where he worked as a busboy and dishwasher, while keeping his job at the fried chicken establishment. He didn't have a single day off for five years because Batman never sleeps. He'd go on to open up a few businesses in the Tulsa area before settling on a car lot he calls Batman's Auto Sales. Now he's running for City Council in Tulsa as a Democrat and has made it past a primary into the general election. He's also a huge giver, as the video above shows. He donated all of his gasoline profits at a station he owned to the Salvation Army for a month. 2. Work at something you enjoy and that's worth of your time and talent. 9. Discipline yourself to save money on even the most modest salary! Despite his funny name, Batman is serious about his work. Even if people have been vandalizing his signs. Don't be a joker, vote Batman!